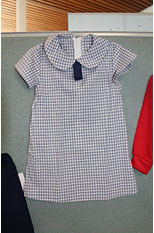 The Majura Primary School P&C runs a uniform shop within the school. The shop offers a full range of uniform items. It is located at the outside undercover area on the Knox Street entrance, opposite the bike shed gates. Majura Primary school prides itself on having the majority of children in full school uniform and understands the importance of keeping our uniform cost effective for families. Only a small margin of 10% is added to the cost of uniform items to cover the shops operating costs. The uniform shop is currently open every Tuesday morning from 8.30 to 9.30, with extended trading times during peak periods in December and January, and during incoming kindergarten interviews. Orders can also be made at any time by completing an order form and leaving it in the uniform shops locked box, for delivery to your classroom. We accept cash or cheque only. In during each term, the uniform shop holds a second hand sale. Donations of clean, pre loved uniform items are greatly appreciated. The items are then sold for $2 each, providing an affordable way for families to access the school uniform. Second hand uniforms can be left in the box in the front foyer. Footwear can be black school shoes or runners but not 'thong-type' or uncovered footwear. All children are to wear a wide brimmed, or bucket hat when outdoors (recess, lunch, sport etc.). Children without a hat sit in a designated shaded area, except for during June and July, as the Cancer Council advises that sun protection is not necessary during these months in Canberra. Once a term the uniform shop volunteers collect the lost property from around the school, sort it and, where possible, return it to your classroom. Items that are not labelled and cannot be returned are displayed in the office corridor for two weeks to give families the opportunity to find their lost items. Unclaimed uniform items are donated to the second hand sale. If you find that the uniform items purchased do not fit your child please feel free to return it to the uniform shop. Items must be unworn and have the tags intact. Volunteering in the uniform shop is easy. You can choose to volunteer once a week, once a term or just once a year, and it can be for as little as one hour each time. Tasks range from serving customers, filling locked box orders, ordering stock online (from home), unpacking stock, sorting second hand donations and returning lost property. No experience is necessary and we understand you may need to bring your younger children along. If you are interested in volunteering, please visit us in the shop, or email the P&C at majuraparentsandcitizens@gmail.com. You can also contact us through the P&C website at majurapandc.webs.com and while you're there, check out all the other activities being led by the parents and carers around the school.